Thule vs Yakima: Why you should choose one over another? The choice of premium bike racks, cargo boxes, and roof racks always boil down to Thule Vs. Yakima. It's a never-ending conversation found in many gear forums and platforms. But today, we want to bury the stalemate and tell you the best brand worthy of your money. Fair enough. Let's jump in. Roof Racks: Thule Vs. Yakima, Who Wins? Thule roof racks are gears that, accommodate everything, plus extra cargo you want to bring in your next trip. That said Thule roof racks have a sophisticated style that improves the exterior of your vehicle. The one thing you will love about the Thule roof racks is the extra storage space for your equipment and luggage. Trust me on this when I say that you can count on the quality of their craftsmanship. Thule roof racks consist of two bars which support the weight of any cargo. They are great option if you have limited space inside your car. The two crossbars that sit on the roof of you can carry a heavy or light load. Most roof racks are of two types. Raised roof rails are a common type of roof racks. They usually run on the length of your roof and rise away from the roof of your car to create a gap between the rails and the roof. The benefit of having a raised roof rail is that it allows you to fit any crossbar on your car to give you the precise fitting. The alternative to raised roof rails is the flush roof rail. Unlike the raised roof fails, they do not have that gap. The biggest difference is in aerodynamics and you are going to need a different type of fitting kit for you to use in your car. Thule roof racks have a great design that encourages smooth air flow. The advantage of having a roof rack like this is because it reduces the possibility of noise. In other words, you are likely not going to hear any noise when you are driving your car. When it comes to security, most of their roof racks have at least two locks. That means, no one will access your things without your permission. Thule specialize in making square crossbars or aerodynamics roof racks to reduce drag and give you a robust surface. Okay, What About Yakima Roof Racks? Unlike Thule, Yakima takes on an innovative space-management approach to their roof racks. Yakima roof racks have everything you need from snowboard to Kayak. They have three versions of roof racks to suit every need you may have. Most Yakima roof racks are modestly priced. They design roof racks for luggage and equipment but not boxes or bags. Like their competitor, Thule, they also have a lifetime warranty. Besides that, the roof racks are also durable. They are premium roof racks that employ the use of aluminum material. Unlike the Thule roof racks that are quite heavy, Yakima is lightweight and also boost a wide surface. Thanks to their design, Yakima roof racks are used on the hidden rails you see on a modern and smaller car. The market for cargo boxes still boils down to Thule and Yakima. Let's see what Thule has in this category. Thule cargo racks are so popular. Not only do they have well-engineered cargo boxes. They also look sleek and elegant. You won't be wrong to say that they are car upgrades you never want your car to miss. The only caveat with Thule cargo boxes is, they came with a steep price. In other words, they are more expensive than Yakima cargo boxes. Does Yakima cargo boxes size up with Thule boxes? They are manufactured in Washington. Unlike their competitor Thule, Yakima puts more focus on the rugged functionality. Yakima cargo doesn't score well in the looks department compared to Thule. Yet, they are less expensive and easier to install. Although design and beauty is not something you will find in Yakima, their rugged functionality takes a sporty and outdoor look. That said, if you care much about visual appearance, Thule cargo boxes will be an excellent addition to your car. Well, that's also possible if the price is no option for you. But if you want a sporty look, with a dash of lightweight performance. You are not wrong if you decide to buy Yakima. Most importantly, if you care about functionality and price. All these products are great; your choice will depend on your needs. Thule and Yakima bike racks still shake the market in this category. Not just in their market share, everything from the designs to functionality. Let's look at each in details. Let's start with Thule. Thule bike racks can accommodate up to 4 bikes, making it a great bike racks for families. While many bike racks are a pain to install like Yakima, Thule takes a different approach in this department. 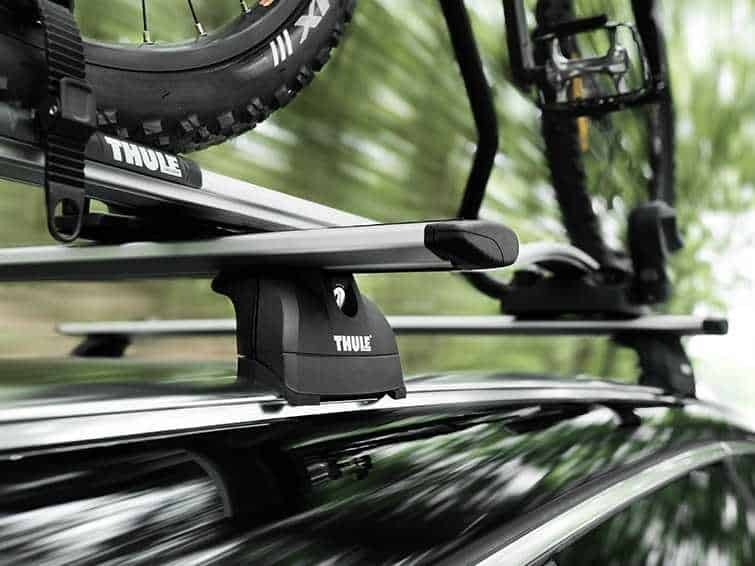 Thule bike rack easy to install. In other words. That means, they are no bolting and drilling you need to install each of their racks. Did I fail to mention that the manufacturer also offers system lock for the racks? The good thing about this is that it will be hard for someone to steal your bike or your bike to wobble when you are driving. Security is essential when you are considering a bike, and Thule scores well in this area. Unlike many bike racks, Thule also comes with anti-sway cages. The importance of this design is to prevent the bike from making contact with your vehicle. Putting all these features together, Thule exceeds in this category than Yakima. First, Yakima takes on a unique character that most cyclists can't resist. One of them is the adjustable spacing between the bikes. Even Thule doesn't have this feature. The area, where Yakima scores best is its versatility. It can accommodate a wide variety of wheel sizes and tire widths. For instance, Yakima Dr. Tray scores highest in versatility because it has a massive tray adjustment that can accommodate bikes with tires of up to five inches wide. Thule can also can accommodate tires of up to 5 inches but it’s tray adjustment is limited. Like the Thule that has a lock system, Yakima comes with zip strips which makes the task of securing your bike easier. Multiple bikes rack that carries up to 4 bikes. Thanks to its tilt design, Yakima offers improved functionality for cyclists. Yes if you are using a new version of Thule parts. In other words, Thule accessories will work perfectly well on Yakima, but it will depend on the age and style. That's because the newer version has a different mounting bracket that fits on the Yakima round bars. No, because an old version of Thule parts won't work. What is the Best Roof Rack? WindDiffuser is a textured surface on the t-slot cover that disturbs the airflow better than a smooth surface, greatly reducing wing noise. SwingBlade end cap pivots open to allow full access to the t-slot for easy accessory installs. AeroBlades work in conjunction with Thule feet and vehicle specific fit kit (sold separately). Please check the Thule fit guide for more information. 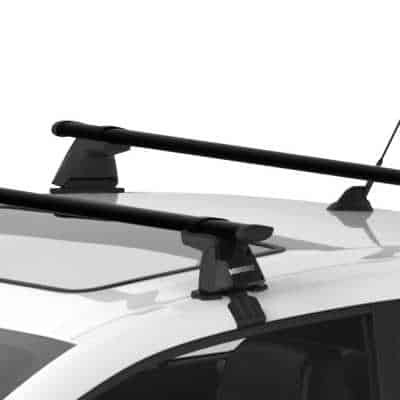 There's no doubt that Thule aeroblade roof rack bar is expensive compared to Yakima roof racks. Well, that's because it is a high-quality design and offers aeroblade with different lengths starting from 43, 47, 53 and 60. This is more than enough for lots of vehicles. Besides that, the roof racks have excellent features that we can't ignore such as wind diffuser, heavy duty, box beam, smart slide system, improved aerodynamics, and T-slides. The only drawback is the cost. What is the best roof cargo box? It has a 17 cubic feet capacity, and it weighs approximately 110 lb. Thanks to its dual-sided open lid, you will be in a position to load and unload your cargo with ease. Besides that, the Thule Hyper XL cargo also has one key system, lock on both sides to make sure that your things are secure all the time. What is the best hitch bike rack? Thule T2 Pro XT the most innovative bike rack on the market. It allows for a tool-free installation and removal process. In other words, you don't need to bolts and other tools to install it. It comes ready. All you need is to load and unload your bikes. Besides that, it has a simple lever which is perfect for tilting rack downward or upwards if you want to access the read of your car. The most advanced feature in this bike rack is the ratcheting arms which secure the wheels of your bike. That means, when you are driving, there's zero chance of wobbling and scratching your car. ​What is the best bike rack? Are you looking for the best bike rack? You can read on our in-depth guide on the subject: Best bike rack on the market and chose the right rack. Comparing Thule and Yakima is difficult because these products appeal to a different market. Thule appeals to customers that care about beauty and all the bells and whistles. Yakima on the hand is perfect for budget-conscious customers who love functionality than beauty. If money is not an option for you, always go with a premium product like Thule. Trust me on this. You won't regret it. It has every upgrade you will need whether you want a cargo box, bike rack, or roof racks. I hope the Thule Vs. Yakima article made you understand the comparison between these two competing products in the market.